I’d like to pay tribute to one of the most interesting men I’ve known in the livestock business. I first met Eddie Arnold while I was setting up in the Saskatchewan Clydesdale Association booth at Agribition one morning in 1989. At the time he was two weeks shy of his 91st birthday. We had a really enjoyable visit, and he said to write sometime. I’m not generally very good at writing letters, but a little before Christmas, I managed to get one sent. In no time at all I had a reply, more neatly written than mine, and definitely more interesting. Eddie mentioned in that letter that improving livestock is one of the most interesting things that there is. 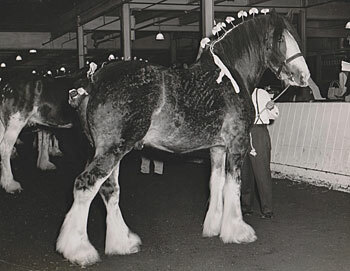 Eddie began showing Clydesdales at the Toronto Royal and the Chicago International in 1925, and showed at Toronto for the last time in 1986, at the age of 88. 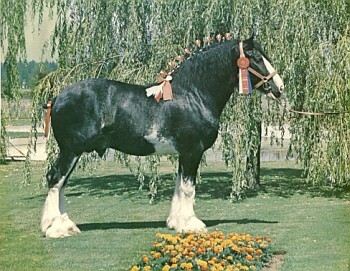 He was one of the best breeders of all time, and some of the better Clydesdales of today still carry the Croydon bloodlines. In the fall of 2004, I was working not so far from Eddie’s home town of Shoal Lake, Manitoba. He would have been coming 106 years old at the time. By that point his hearing was quite poor, but otherwise he was in remarkable shape. I don’t suppose I’ve met anyone with a memory like his. Sometimes as folks get older the past stays sharp and clear, but the present is sometimes a little fuzzy. Not so with Eddie - it didn’t matter whether it was past or present he was crystal clear about everything. His accuracy at remembering details about horses and livestock from the past was also second to none. He could remember who had stood in what placing at a certain show, etc. from way back in the 1920s and 30s. Over the years Eddie and I wrote back and forth a bit. I kept all of his letters - they were always very interesting, and there was a lot of draft horse history in each one. One of Eddie’s closest Clydesdale breeders was Clarence Martin of Strathclair - the next town up the road. Clarence was another one of my favorites - a first rate man, he passed away a few years prior to Eddie. Maybe one of these times I’ll take some time and write a few notes about Clarence and some of the other draft horse breeders who have passed on.